To power up your Loxone system you need a 24V power supply. This 24V DIN rail mounted switchmode power supply is perfect for this task. Fits alongside the Miniserver in your consumer unit. Its profile matches that of a standard breaker meaning it can easily be fitted alongside the Miniserver in your consumer unit. The maximum current this unit can supply is 0.4A meaning it is suitable, for example, for powering the Loxone Miniserver and a 1-Wire extension. 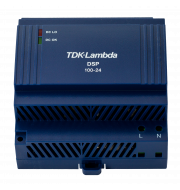 The Loxone DIN rail mounted power supply from TDK-Lambda is perfect 24V supply for your Loxone Installation and will slot in neatly along side your Miniserver on the DIN rail.